Durham ARC sent a sizeable contingent to Strathclyde Park Regatta over the weekend of April 28th and 29th and returned with a good haul of medals. 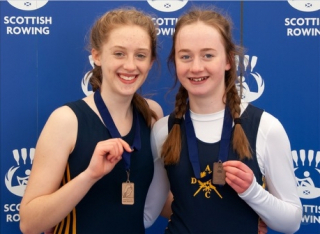 Following the postponement of Chester-le-Street Regatta this was the first event of the season for many, a multi-lane regatta (2000 metres for juniors and seniors and 1000 metres for masters), which also incorporated the Scottish Student Rowing Championships. The venue has added significance this year as the rowing events at the inaugural European Championships in Glasgow will be staged there on August 2nd to 5th. From 12 entries on Saturday there were two wins, two second places and 3 third places. The first places went to the J15 coxed quad (Thomas Taylor, Ben Brown, Dom Crilley and Matthew Harrison, coxed by Emily Shaw from St Leonard’s), and the WJ13 double of Libby Morris and Tilly Stoddard (left). DARC finished 2nd and 3rd in the Masters D/E double sculls, and there were also third place finishes for the J18 coxless quad and the WJ14 coxed quad. Sunday produced one win and three second places from five entries, the win going to Kim Forster and David Muse (above) in the Open Masters B Restricted2 double sculls, and following Kim’s 2nd place in the Women’s Masters C single on Saturday and David’s 2nd in the Masters B single on Sunday rounded off a particularly successful weekend. Other 2nd places went to George Adair, Gerry Sharpe, Michael Seed and David Oliver in the Masters F coxless quad, and to the Open Restricted1 coxless quad (Can Evirgen, Mert Evirgen, Will Hamlyn and Reece Stockport). This entry was posted in Racing News on April 30, 2018 by Colin Lawson. With less than two months to go until the 185th Durham Regatta it’s time to reflect on some of the Club’s past glories. In its early years Durham Amateur Rowing Club had considerable success at winning Durham Regatta’s most prestigious trophy, the Grand Challenge Cup for coxed fours, the first victory coming in 1863 for the crew of W.Brignall, W.H.Hedley, C.Rowlandson, P.Forster and cox E.H.Dykes. This was only 3 years after the club’s formation in 1860 (see Club History Timeline). Ten more victories followed in the years up to 1901, and 4 more between the Wars. Durham ARC also won the Wharton Challenge Cup (now known as the Durham Challenge Cup) in the first 5 years following its inception in 1877, the first victory going to E.A.Lowe, L.Ward, A.Ward, S.F.Prest and cox G.F.Bell. At this time John Lloyd Wharton, whose portrait (left) is on display at Wharton Park, and after whose uncle William Lloyd Wharton the trophy was named, was Club President, a position he held from 1861 to 1894. The Wharton Challenge Cup went to R.R.Powney, J.W.Walton, J.Hopper and R.Powney, coxed by W.E.Coldicot in 1928 and 1929. Another double success was to come twenty years later for the post-war four of R.Layfield, J.H.McGregor, J.W.Golightly, P.H.Mills and cox R.E.Brown, winning in 1948 and defending the trophy successfully in 1949. The best run of success was the nine consecutive wins in the Grand Challenge Cup between 1955 and 1963. Current Club President Ian Shepherd (pictured with Jess Eddie after winning an Olympic silver medal with the GB women’s 8+ in 2016) was involved in eight of these, starting with the 1956 victory. His predecessor as President, Bill Parker, was in the crew for five of the wins, and Keith Yates who has been the commentator at Durham Regatta since 1976, coxed the crew to victory on five occasions between 1958 and 1962. The same crew also secured the Wharton Challenge Cup eight times during this period, with the combination of F.Weatherley, W.T.Parker, I.C.Shepherd, H.Smith and cox K.J.Yates winning both trophies three times in succession between 1960 and 1962. The club’s most recent win in the Wharton Challenge Cup was by R.H.F.Metcalfe, R.G.Oates, R.A.Longhurst, J.R.Appleby and cox A.G.Bailes in 1969. In total DARC has won the Wharton Challenge Cup 37 times and the Grand Challenge Cup thirty times, the most recent being the 1992 Grand win by G.Wilson, K.Oates, M.Terry , R.Bodsworth and cox Toni Spoors. The 2018 Durham Regatta takes place on June 9th and 10th. 1888 A.Morgan , E.Bulman, H.Rule, E.White, cox S.Salkeld. 1928 R.R.Powney, J.W.Walton, J.Hopper, R.Powney, cox W.E.Coldicot. 1929 R.R.Powney, J.W.Walton, J.Hopper, R.Powney, cox W.E.Coldicot. 1930 R.Longstaff, R.Powney, J.Hopper, Alex McLaren. Cox W.E.Coldicot. 1960 F.Weatherley, W.T.Parker, I.C.Shepherd, H.Smith, cox K.J.Yates. 1900 A.P.Hough, R.C.Cumberlege, H.Peele, E.H.Veitch, cox G.Patrick. 1905 R.Hill, W.Coulson, L.Mackay, H.Liddle, cox A.S.Coxon. 1923 J.Veitch, W.Skipsey, A.D.Calvert, G.R.Herbert, cox H.W.Coyne. 1931 R.Longstaff, S.Pearson, J.Hopper, R.Powney, cox G.Greenwell. 1935 G.Blagdon, W.R.Martin, C.A.Riley, L.Shaw, cox R.Nelson. This entry was posted in Club News on April 11, 2018 by Colin Lawson.